Getting feedback on oil painting practice is a great way of gaining a fresh perspective upon a work of art. This will bring to focus issues the artist might have been unaware of. 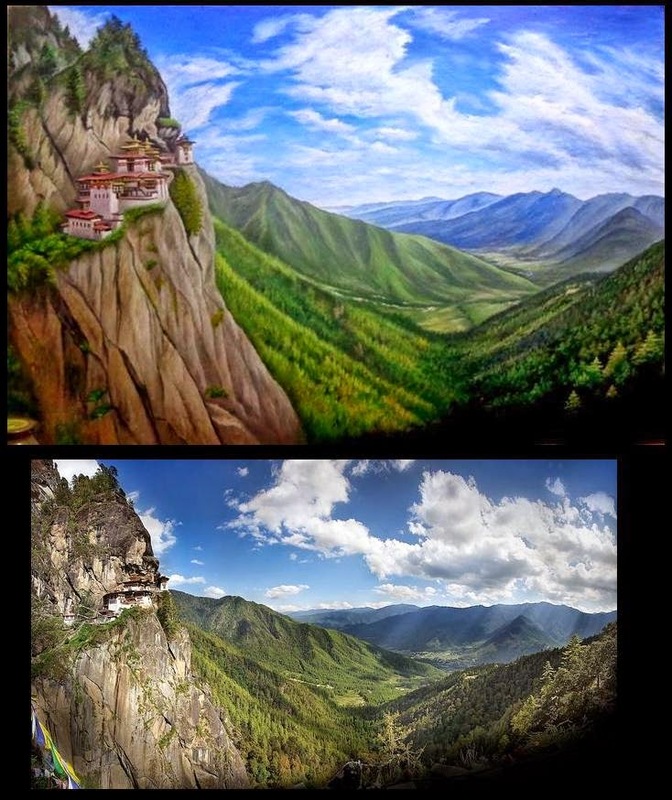 The focus of this article in this vein is a detailed landscape painting of the Tiger’s Nest Monastery by Ugyen Wangdi. Perched on the edge of a cliff, the Tiger’s Nest Monastery in Bhutan, also known as Paro Taktsang, is one of the most dramatic temples in the world. Above 10,000 feet above sea level, this Himalayan Buddhist temple is considered one of the holiest of the Buddhist people. Many challenges confront the artist in painting this dramatic scene, one of which is creating a sense of space. The artist has shown great patience with rendering detail and soft blending on this painting, which must have taken many hours to do. Effects such as this can be achieved either by a series of soft glazes or by soft brushing with sables. The result is a fantasy-type landscape that is illustrative in effect with great visual appeal. The sweeping valley to the right of the picture could have lacked interest for the large empty spaces. However, the dappled shadows within the woodlands draw the eye to a snaking valley floor and throughout the painting. Similarly, the artist has demonstrated visual awareness of how the greens shift to mauves and violets in the background, helping to suggest distance. These colours echo with the blues of the sky bringing harmony and balance. The painting as a result has a great sense of depth. One of the biggest challenges is the temple nestling on the Cliffside. The buildings, being quite old do not conform to the rules of perspectives that perpendicular buildings do, so extra attention is needed to get the angles right. The artist has sensitively observed the outlines of the buildings and how the angles relate to the cliff face. The painting has illustrative qualities, creating an idyllic feel. The artist has expressed a wish to achieve realism. Concentrating on light and shadow rather than detail is one way of gaining a fresh perspective upon a scene. A photograph showing the Tiger’s Nest under high contrast, such as on a bright sunny day will enable the artist to explore tonal contrasts above detail. Sitting too close to the painting can also cause the style to become tight and over-refined. I find it is a good idea to stand back and view the painting from a distance whilst it is in progress. Half-close the eyes in order to simplify the view into a few basic shapes. Limit brushes only to the wider variety, such as large bristle brushes to inject a looser style. Again, the sky is illustrative and visually appealing. The cloud bases appear to curve from one side of the painting to the other, creating a vortex feel with the landscape. Cloud bases are usually flat in formation. Standing back from the painting will help clarify how the shapes within the painting fit together in a broader sense, where sitting too close can conceal issues. Perfecting an art technique can sometimes get in the way of learning new techniques in oil painting. Taking a look at how other landscape artists tackle their subject matter will help spur experimentation and trying new techniques. Recommended are the French Impressionists, Cezanne, Monet, Pissarro and Sisley. Other recommended are Corot, Van Gough, Matisse, El Greco, Kandinsky, Derain and Metzinger. These are to name but a few. The high detail and blending techniques gives the painting an illustrative, almost fantasy feel. Empty spaces could have afflicted the scene but the artist has provided interesting shadows in the trees which lead the eye to the snaking valley in the distance. The subtle shift from green to violet emphasizes a sense of distance which contrasts with the temple. Working too closely to the painting can cause the artist to agonize over detail with the danger of a tight style. An impressionist feel can be brought about by obtaining a photograph of the scene with high tonal contrasts and then working on the painting anew with large brushes. Break down the scene into basic areas of light and shadow, and view each area a generalized way. Stand back from the painting at regular intervals in order to get an overall view of how the tones fit together. Taking a look at how other artists approach landscape painting cannot fail to offer inspiration and spur the artist to try new techniques. This contrasting way of working helps the artist get a more rounded approach to oil painting. Read here on tips for trying different artistic approaches. Read how to enter your painting. You use the term "illustrative" frequently in this article. What do you mean specifically by it? Illustrative as opposed to what? Examples to reference illustrative and non-illustrative? Illustrative means by use of high detail or lines as opposed to splotches of paint in the manner of the Impressionists. Some artist like to use high detail, others use economy with brush marks.